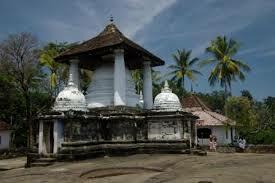 Gadaladeniya Temple is located at Pilimathalawa, Kandy. When you are driving from Colombo to Kandy, Gadaladeniaya temple road is at your right hand side. After taking that turn from Pilimathalawa, you have to travel another 2 km. 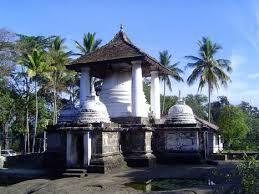 The famous Embekke Devalaya and Lanka Thilaka Viharaya also located close by. 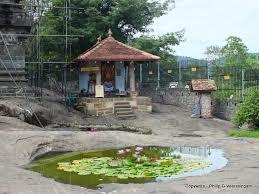 The Gadaladeniya temple is located in a small hilltop, but can easily reach from the main road. If you are coming by a small vehicles like a car or a van, you can just drive up. Once you are in the summit, you can get a good view of the surrounding area from here. 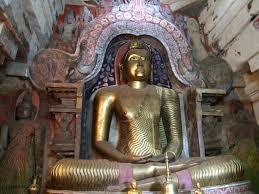 Gadaladeniaya Temple was build by king Wickramabahu in 1344 during the Gampola Kingdom time. At the entrance you can see the Dageba ( pagoda) by your right hand side. Actually this consist of one main Dageba and four small ones. The main Dageba is covered with a roof. There are four small shrine rooms around it with small dageba located top of each. The Boo tree is located in front of the dageba and there is a old inscription located by it. You can see that is covered with a fence to prevent from damaging. In the main shrine room has a large Buddha statue. 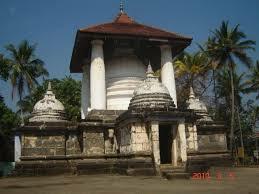 This temple has some features of the south Indian architecture. At the time of our visits, we saw this shrine room was covered with a temporary roof and the archaeological view of the place is greatly affected by that. Most of the painting in this temple also fading. There is a devalaya, dedicated to god ?Vishnu? is located next to the shrine room.